Before we embark on our own spring campaign of posts on the brutal 1864 spring campaign, it would be beneficial to discuss some fundamental changes that were taking place in the Army of the Potomac. On March 9th, President Lincoln himself handed Ulysses S. Grant his commission as Lieutenant General in command of all Union armies. Grant decided to make his headquarters in the field, rather than in Washington, and Major General George Meade, still in command of the Army of the Potomac, found this to be a rather awkward, uncomfortable, and even difficult arrangement. On March 26th, 1864, The New York Times ran an article titled “The Army of the Potomac and its Reorganization.” The article focused on the consolidation of the army’s five corps into three with a separate cavalry corps. The First and Third Corps would be disbanded an their units distributed among the Second, Fifth and Sixth Corps. This consolidation was necessary to simplify the command structure and to maintain the fighting strength of individual brigades, divisions and corps, but it must have been quite difficult initially. Some officers found themselves suddenly without a command, and brigades were formed with regiments that previously had not gone into combat together. Ever since their arrival in Arlington, VA about August 30, 1862, our friends in the Fourteenth Connecticut Volunteer Infantry had been in the Second Brigade of the Third Division of the Second Corps along with two other regiments, the 108th New York and the 130th Pennsylvania. The men of 130th Pennsylvania enlisted for nine months service and they were mustered out May 21st, 1863. At Gettysburg, the Second Brigade consisted of four regiments—14th Connecticut, 1st Delaware, 12th New Jersey, 108th New York—and a battalion of the 10th New York. But these five units would not escape the massive shuffling of the army in March 1864. Col. Thomas Smyth, a volunteer soldier who had risen through the ranks to command their brigade, was transferred to a brigade in the First Division. The old Second Brigade, Third Division was incorporated into the Third Brigade, Second Division, under the command of Col. Samuel Carroll, who was a West Point trained professional soldier. This new home for the Fourteenth consisted of nine units: 14th Connecticut, 1st Delaware, 14th Indiana, 12th New Jersey, 10th New York (Battalion), 108th New York, 4th Ohio, 8th Ohio, and the 7th West Virginia. This entry was posted in 1864 - Winter, General Information on March 14, 2014 by admin. There, my reflections are interrupted by the approach of a corporal with two butternut-colored prisoners who have just deserted the the enemy’s picket post here at the ford, and waded the cold, deep stream to take refuge within our lines. They are men of some 40 years of age, with families in North Carolina, conscripted six months since, and apparently overjoyed at the successful opportunity of escape which they have long been watching for. They report the one uniform story we hear every day from such stragglers into our lines, of discontent in the rebel camps, especially among the North Carolina troops. Every camp is most carefully guarded, they say; no man allowed to leave on any excuse; rations very short and precarious; sometimes many days without any meat, and then a tiny bit of bacon or fresh beef, their staple article corn meal. Throughout the Confederacy, there were pockets of strong pro-Union sentiment. This was particularly true in the high country of western North Carolina and eastern Tennessee. Imagine if you were conscripted into the army of a government you didn’t support to fight for a cause you didn’t believe in. The shoes you left home with were soon destroyed by hard marching and the army didn’t replace them—you took the nearly soleless ones you’re wearing now from a corpse. Your empty belly gnaws at you constantly, you’re sick all the time, and you just received a letter from your desperate wife telling you your children are on the verge of starvation. Across the river, just a short hundred yards away you see the warmly dressed and well equipped Union pickets eating well every day and enjoying real, hot coffee. What would you do? This entry was posted in 1864 - Winter, General Information, Life in Camp, Men of the 14th on March 7, 2014 by admin. Fiske’s very next letter, dated February 26th, described a grand ball thrown by the officers of the Second Corps on Feb. 22nd in honor of George Washington’s birthday. A new 7,500 square foot ballroom was built for the occasion near Brandy Station. The best food and drink was consumed in abundance. Officers danced with their wives and other ladies who were in attendance. The picture below was originally sketched by artist Edwin Forbes and may be found at the Library of Congress (click on the picture). 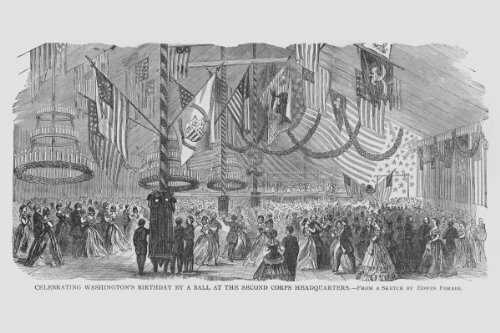 It clearly shows the splendor of the event; check out the chandeliers and flags. I just hope it wasn’t at the expense of the grunts on the picket line. But like I said at the start of this post—you be the judge. This entry was posted in 1864 - Winter, General Information, Life in Camp, Men of the 14th on February 21, 2014 by admin. Dear Republican: We had a real dedication yesterday of a house of God, built of logs and plastered with mud, and covered with canvas furnished by the Christian Commission, pewed with log benches and able to accommodate 150 people with comfort. It seemed actually like “going to meeting” again, for we had a dozen ladies in the audience and good singing and a good sermon and good worship every way. When the chapter describing the glorious dedication of Solomon’s temple was read, it occurred to me that there was something of a contrast between the scene in Jerusalem and our humble dedication service on the bank of the Rapidan. But “all the people said amen” I think in both cases; and if the spirit of the Lord filled with a cloud of glory that temple built of fragrant cedar and overlaid with shining gold, perhaps He was equally present with us in our temple of riven pine overlaid with Virginia mud. This entry was posted in 1864 - Winter, Life in Camp, Men of the 14th on February 14, 2014 by admin. The addition of the Second Brigade stabilized the Federal line. As the afternoon wore on, the fighting became more intense, sometimes hand to hand. At dusk the Confederates renewed the attack on the Federal right flank, but three regiments, one of which was the Fourteenth Connecticut counterattacked and pushed the Confederates back. Everyone involved on both sides knew Federal position was untenable and Gen. Warren ordered Gen. Hays to withdraw his troops. As darkness fell, Hays’ saddle took a direct hit from an enemy minié ball. The general crashed to the ground, shaken but uninjured. A stalemate developed when neither side wished to make any move in the darkness. Here and there small pockets of combatants fought desperate, almost private battles. At about eight o’clock the Federals began to fall back toward the Rapidan and crossed to the north bank by midnight. Federal casualties were about 254. 115 were members of the Fourteenth, 14 killed or mortally wounded, 85 wounded, 16 missing. Do you know that when our Second Corps was ordered on that reconnaissance February 6th General Warren was so drunk as to be unable to be with the corps until nearly sundown? The papers say he was unwell, but the truth is he was drunk. General Alexander Hays, our division commander, had just enough whiskey in him to make him reckless and almost like a crazy man. Colonel Powers, commanding the brigade was really unfit to command by reason of liquor. I suppose I am liable to court martial for thus speaking of my superior officers, but it is the truth. Fiction Connection: In my novel An Eye for Glory, Sgt. Michael Palmer was home on furlough during the debacle at Morton’s Ford, but his friend, Cpl. Jim Adams, returned from the foray across the Rapidan with a large Bowie knife that he had taken from an unfortunate Rebel during the desperate fighting in the dark. This entry was posted in 1864 - Winter, Battles of the 14th, Men of the 14th on February 7, 2014 by admin. The Battle of Morton’s Ford mattered little in the grand scope of the Civil War, but to the men of the Fourteenth, it was more costly than either Antietam or Fredericksburg. And it all came to pass because one of the most despised Union generals, Benjamin Butler, then in command of the Army of the James east of Richmond, had the notion that he could take the Confederate capital, if only the Army of the Potomac pressured Lee along the Rapidan line. The Second Corps was given the task of carrying out a “demonstration” at Morton’s Ford. Maj. Gen. Gouverneur Warren was reported sick and confined to quarters, so command of the corps fell upon Brig. Gen. John Caldwell. Early on the morning of Saturday, February 6th, 1864, Caldwell sent the Third Division, still under the command of Brig. Gen. Alexander Hays toward the Rapidan River. Seeing only a thin skirmish line on the other side, the First Brigade forded the icy river at about 10:30 a.m., and under the cover of a cold rain captured some of the Rebel pickets. Then they advanced up the slope toward the buildings of the Morton farm, but the firing at the picket line had alerted the enemy of their presence. The brigade came under sporadic fire and stopped about 800 yards from the main Confederate line. Batteries of artillery were brought up to the river, and at about 1:30 p.m., the Second Brigade, under Col. Thomas Smyth and which included the Fourteenth Connecticut, was ordered to ford the river in support of the First Brigade. The position of the Union men was a hazardous one, being exposed to an attack from the right, left and front, or from all three quarters combined by a greatly superior force, and such an attack could hardly have failed to dislodge the Union forces from the shallow ravine and drive them back in confusion upon the river. General Hays rode back and forth upon his galloping steed, his reckless manner and incoherent language indicating that he had added two or three extra fingers to his morning dram. General Warren was also indisposed the early part of the day, his indisposition lifting itself and allowing him to be on the field late in the afternoon for a few minutes. The brigade commander (Col. Charles Powers, 108th NY) was also so seriously indisposed as to be unable to sit upon his saddle or even to walk about, but sat listlessly in a large arm-chair brought from one of the neighboring houses. Early in the afternoon a body of Confederate troops attacked the First Brigade. The Second Brigade was called to go in support and the men of the Fourteenth Connecticut surged forward into the battle. Meanwhile, back in their camp at Stony Mountain, another group of officers’ wives had arrived from Brandy Station. Imagine their torment when, instead of enjoying sweet reunions with their husbands, they witnessed the developing battle from atop the low hill, and could only imagine what their husbands were going through. This entry was posted in 1864 - Winter, Battles of the 14th, Men of the 14th on January 31, 2014 by admin.